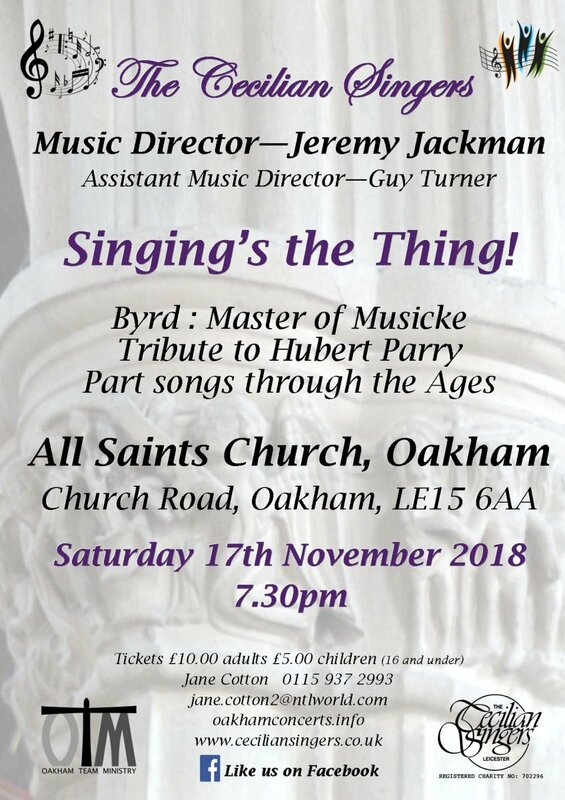 Venue: All Saints Church, Church Road, Oakham LE15 6AA. Programme Details: Byrd "Master of Music", Part Songs through the ages, Out of Africa, Tribute to Hubert Parry, Gershwin, Rogers & Hart, Miss Otis regrets, Everytime we say goodbye, Slow Train & Transport of Delight - Flanders & Swan. Venue: St Michael and All Angels Church, Bramcote, Nottingham. Programme Details: Miscellaneous items through the centuries (including Miserericordias by Mozart) from Cecilian singers repertoire: Teleman; Viola Concerto: Handel; "Dominus Dixit"
Venue: La Cattedrale dei Santi Pietro e Francesco, Massa. Programme Details: Part of the tour of Tuscany, Italy 2017. Venue: St. Mark's English Church, Florence . Venue: Duomo di San Martino, Lucca..
Programme Details: Details: 'A String of Pearls'. Music ranging from folk songs, Brahms, Parry and a selection from the choir's lighter repertoire. Programme Details: 'The Gift of Song'. Music by Bullard, Chilcott, Bach, Bruckner, Lassus, and lighter pieces. 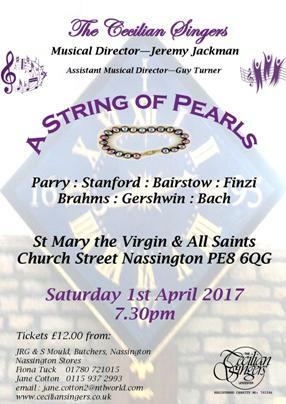 Programme Details: 'A String of Pearls' - A shared concert with Vokalensemble 'Voices', Munchenstein, Swiss Ladies Choir. Part of the Brandenburg Choral Festival of London 2015 Autumn Series. 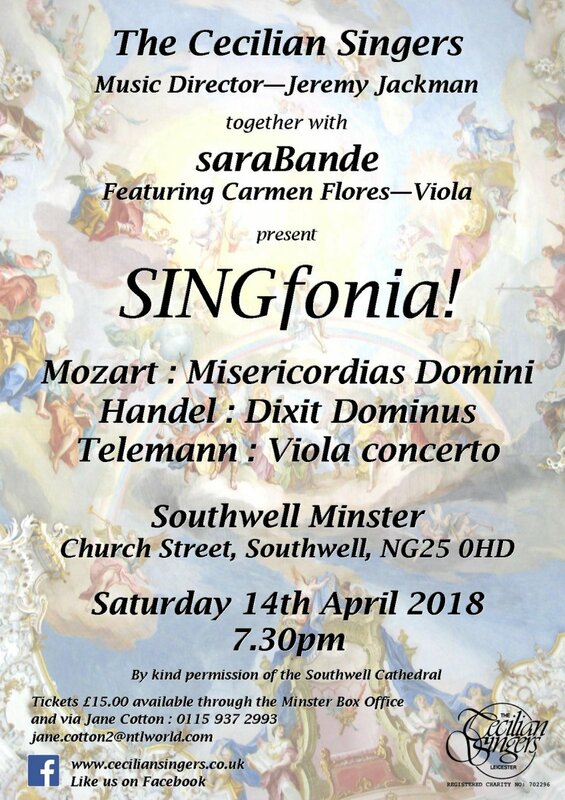 Programme Details: 'Singfonia' - The Cecilian Singers join saraBande Orchestra for a programme of choral and instrumental favourites. Programme Details: Part of 'Music in the Great Hall Series' supporting the work of Southwell Minster Choir Association. Programme included music by Tomkins, Byrd, Chilcott, Battishill and Jackman. Venue: St. Peter's Church, Widmerpool, Notts. Programme Details: Recording of new compositions and arrangements by John Heyes. 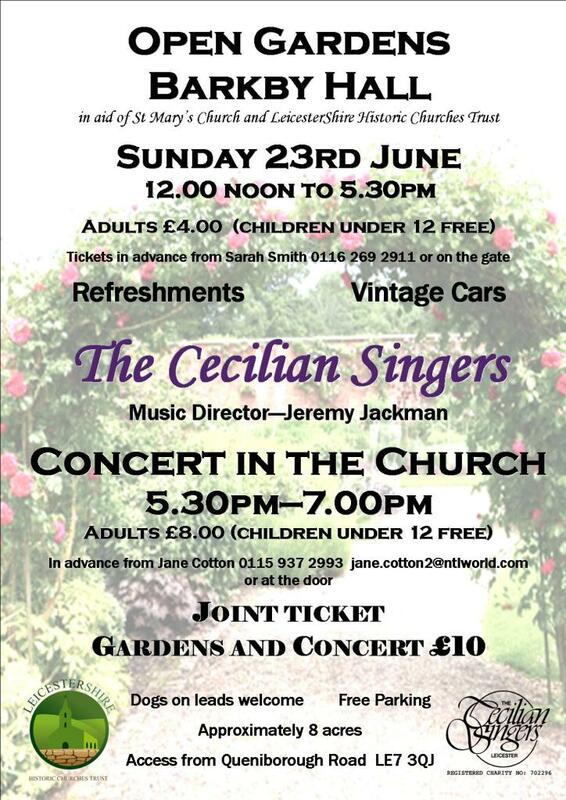 Venue: St Michael and All Angels Church, Bramcote, Notts. Venue: Wigston Magna Methodist Church, Leicester. Programme Details: "My Spirit Sang All Day!" Programme included Byrd, Attwood, Battishill, Schumann, Finzi plus lighter pieces. Programme Details: "When Music Sounds!" 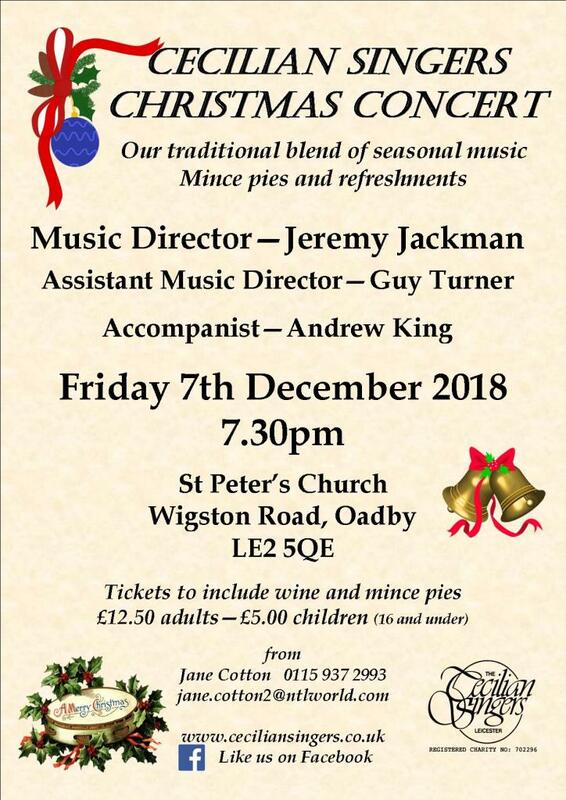 Concert in aid of the Radcliffe Methodist and Community Project. Programme included Weelkes, Purcell, Henry Leslie, Bernard Rose, Schumann, Jackman plus lighter pieces. Programme Details: 'From Darkness to Light' Programme includes Allegri's and MacMillan's 'Miserere', Lauridsen's 'Lux Aeterna', Britten's 'Te Deum in C' and music by Byrd, Brahms and Mendelssohn. Programme Details: After-dinner entertainment for Board Directors & spouses from Caterpillar Machinery, USA. Venue: Dingley Parish Church, Nr. Market Harborough, Leicestershire. Programme Details: 'Autumn Leaves' - including Mendelssohn's 'Sechs Lieder Op. 59' and Naylor's 'Vox Dicentis'. 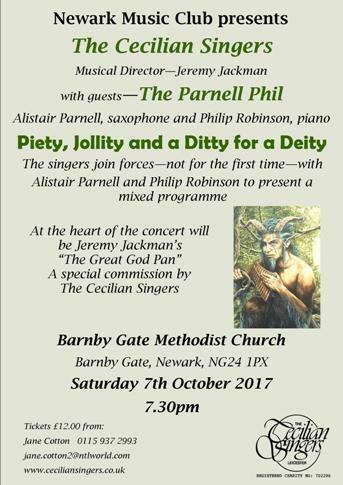 Programme Details: "Reed Warblers" including "The Great God Pan" & "Jack the Jolly Tar"
Programme Details: Seasons, Spirituals and Swing! Programme Details: Choirs of Two Cities. Joint concert with Lincoln Chorale. Venue: Dingley Parish Church, Market Harborough, Leics. Venue: All Saints Church, Stamford, Lincs.